Our steel frame tents are constructed of high quality, heavy 16- gauge vinyl, with solid, window, or mesh wall panels, and gabled roofs. 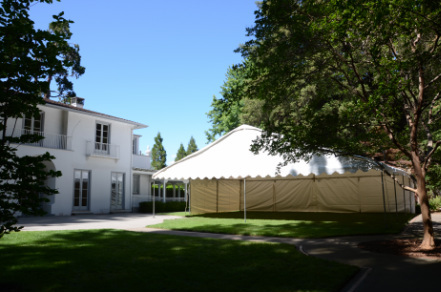 Sourced from a top manufacturer in California, we pride ourselves on offering our clients the highest quality tents available that are always clean and well maintained. Our canvas material meets the highest specifications for fire resistance, specified by the state of California. All of our tents are modularly designed to accommodate events or structure requirements of virtually any size, ranging from 10 x 10 to 40 x 100 or larger. Call us today to reserve the perfect tent for your next event!